Have backpack, ready to go! -1. Heavy-duty & Air Permeable. -3. 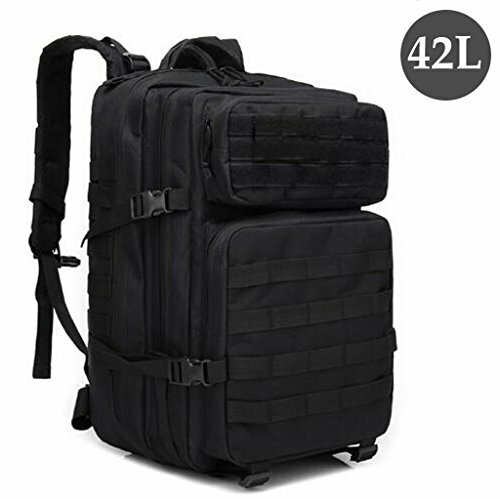 Large capacity: This pack offers a great amount of carrying space and is perfect for military as well as camping and hiking. -4. Sturdy structure: features 2 large compartments with various zippers and mesh inner pockets and 2 small front pockets (one with organizer), as well as a built-in Velcro pocket for a hydro pack. All compartments are closed with sturdy 2-way zippers. -5. Ergonomically designed: shoulder straps are padded, about 5cm wide and adjustable in length. Moreover the pack goes with a padded back and an adjustable waist strap opened with a clip. The pack allows for volume control and baggage fixation thanks to a number of a lateral compression straps and gives a possibility to attach additional equipment through a number of robust nylon MOLLE straps all-round, and loops and D-rings on shoulder straps. Our mission is to offer superior customer service that results in a premium shopping experience.